TriTAG sees itself as an organization focused on transportation issues. That’s not to say that we don’t have concern for environmental issues, but that we look at a wide range of benefits from improvements to how we get around, not just environmental – we’re also motivated by the impact transportation has on quality of life, public health, safety, social justice, economic growth, government spending, and even civic engagement. All that said, we acknowledge the reality of global climate change, and our responsibility as a community to respond to it. World leaders have just adopted an agreement that will require sustained reductions in carbon emissions. Changes in transportation will play a role in how emissions are reduced, and walking, cycling, and transit can and should play a large role in that. Transportation in Waterloo Region accounted for 1,467,858 tonnes of carbon emissions in 2010, or 40% of the Region’s total. The Regional Transportation Master Plan is anticipated to bring about 75,000 tonnes of emission reductions by the end of 2020, through the introduction of ION light rail and more iXpress bus routes. These changes are expected to increase transit ridership from about 5-6% today to 15-17% by 2031. By comparison, the Region’s targets when it comes to active transportation are far more modest. (Even ‘wimpy’, according to the Easy Riders Cycling Club.) If the Region’s targets are met, it would only increase cycling mode share from 1% to 3% by 2031. From a climate perspective, this sort of change barely registers. 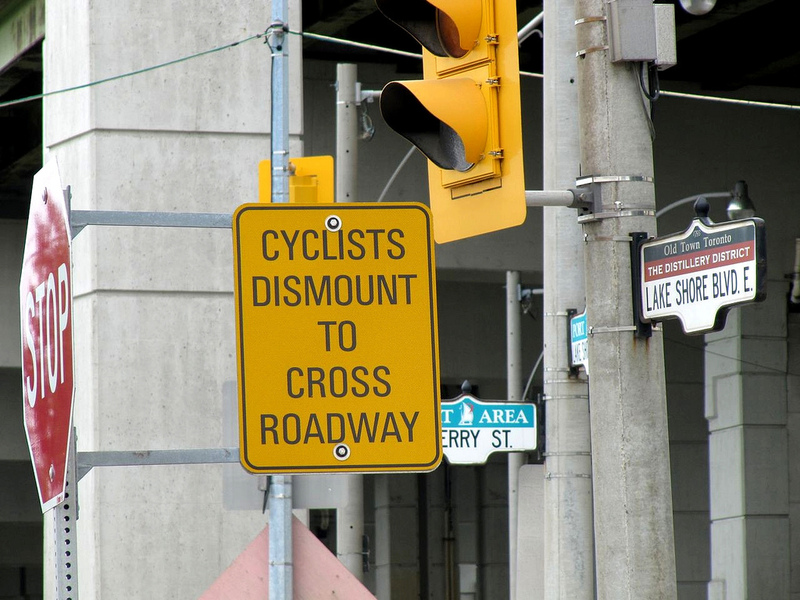 Regional staff think they can reduce bike crashes with ‘cyclist dismount’ signs. Provincial guidelines say that’s a bad idea. It’s no surprise that over half of all collisions between bikes and cars take place in crosswalks. It’s partly why our local municipalities have opted to prohibit sidewalk cycling in their bylaws. Some might argue it’s the victim’s own fault if they’re struck while biking in a crosswalk, as they’re willfully breaking the rules of the road. But when it comes to other issues of public health, such as smoking, substance abuse, or even sedentary lifestyles and poor diets, we don’t allow a person’s choices to prevent us from trying to protect them from unnecessary illness, injury, or death. Preventing traffic violence should be no different. In fact, traffic engineers recognize that they can’t just expect drivers to perfectly follow speed limits or obey signs to protect themselves, but have to apply good design and analysis to protect drivers from their own mistakes, (not to mention their passengers or others on the road). This may involve changing the environment so that mistakes are less deadly, or changing the factors which influence people to make those mistakes in the first place. Each year as part of the Region’s collision report, the top locations for crashes are determined for people driving, walking, and biking, and countermeasures are considered to try to reduce frequently encountered types of collisions. For top collision locations for cars, changes including conversions to roundabouts, addition of left turn lanes, and dedicated turning phases are considered. For many of the top locations where people walking are struck, better lighting, countdown timers, more visible markings, and crosswalk relocation are all on the table. For King and Cedar, where several people biking with the sharrows have been struck by turning cars, staff are considering restricting certain turns. 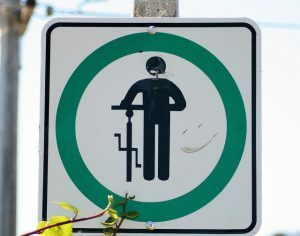 This sign is used to tell people biking to dismount and walk, which the Ontario Traffic Manual discourages. Photo (C) 2011 Richard Masoner on Flickr, licensed under CC-BY-SA. But when it comes to people getting hit by cars while biking in crosswalks, it seems the best staff think they can do is put up a bunch of ‘cyclist dismount’ signs. It ignores the real source of the problem. Many of these collision locations are terrible places to bike, leading many to conclude that it’s safer for them to use the sidewalk than the road. Protected bike lanes along these roads, coupled with good intersection design would go a long way towards improving safety. It implies cycling on the sidewalk is otherwise acceptable. Putting up signs for cyclists who are on sidewalks would suggest they are expected to be there, which isn’t the case. Even if people biking obeyed the signs and walked their bikes, there would still be conflicts between people walking and biking on sidewalks. It’s not a viable solution for when sidewalks are changed to multi-use trails. The Region is increasingly looking to using wider multi-use trails in place of sidewalks and bike lanes on busy roads with no driveways. One of the top collision locations, Ottawa at the Laurentian Power Centre entrance, is expected to get multi-use paths sometime around 2020. If we are going to build pathways along roads, we need to design intersections to accommodate people who bike, not effectively ignore them. Sometimes, paying attention to the actual factors that change behaviour and influence collisions is hard, and putting up signs can make us feel like we’re doing something. Preventing people from being struck by cars in crosswalks requires more than just tsk-tsking them for not dismounting from their bikes, but appropriate infrastructure with good design to accommodate them. We hope to find better solutions in future collision reports. Headline photo (C) 2010 James Schwartz on Flickr, licensed under CC-BY-ND 2.0. Kitchener’s Cycling Master Plan at risk: who owns the street? Could a vocal opposition prevent Kitchener’s cycling network from being connected and useful? Kitchener City Council will be voting on whether to put bike lanes on Union Street (Margaret to Lancaster) on Monday, October 5 at 7pm. While Union has been approved as part of the bicycle priority network in Kitchener’s Cycling Master Plan since 2010, and a tentative design was approved last month at the Community and Infrastructure Services Committee, opposition from some residents threatens to overturn these plans, putting the priority network as a whole at risk. 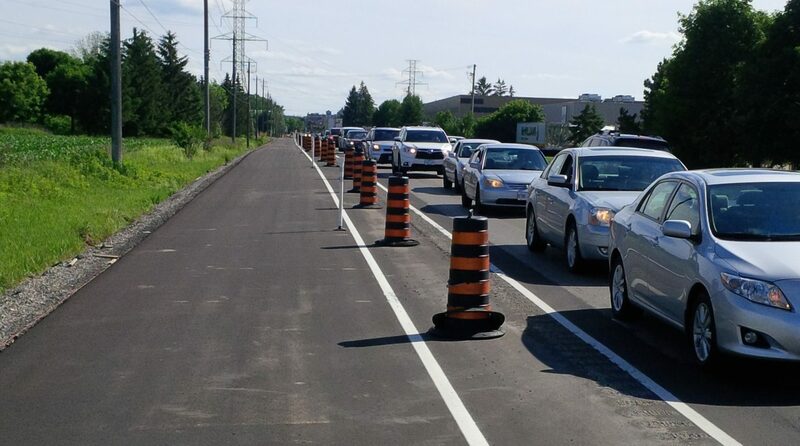 Last month, in the face of vocal opposition, Kitchener City Council opted to shelve a staff-recommended design for buffered bike lanes on Westheights Drive in favour of a compromise design that preserves parking on both sides of the street. While the compromise design affords some improvement to the experience of cycling on the street and could contribute to safer traffic speeds, the decision has made those who advocate for a useful and safe cycling network concerned about future decisions. The compromise decision was not made on technical merits, but rather on political considerations. Based on data collected systematically by City staff for on-street parking use, reducing parking to one side of the street would have been more than sufficient for resident needs. But to the residents who protested to Council, this wasn’t enough, so Council sought a solution that would satisfy them. It may be easy to assume that Westheights was a good example of democracy at work: the people spoke, and Council listened. But scratch the surface a little, and you will find this interpretation problematic. Second, even if the delegates were truly representative of the residents of the street, giving them final say over a street’s design privatizes the public realm and excludes many other important stakeholders. To be sure, those adjacent to a street are important stakeholders, and should be consulted. But a street does not exist merely for the benefit of the property owners along it, but for the public at large. In the case of Westheights and Union, traffic counts reveal that thousands more residents and visitors from surrounding streets and neighbourhoods use the roadway than just those from properties lining these streets. Unfortunately, the City’s own consultation processes, by engaging predominantly with residents from the street itself, feeds this perception that these collector roads are for their private benefit. It may be challenging, but future consultation efforts should attempt to reach out more to the broader cross-section of a street’s current and potential users to get a more representative view of public desires and needs. In the case of Union Street, there simply isn’t enough space for a compromise like Westheights to accommodate parking on both sides and still have usable bike lanes. And reducing the parking supply to one side still leaves nearly four times as much parking as there is demand. But like Westheights, we anticipate opposition to this change to be fierce. Fortunately, you can help to bring safe cycling facilities to Union and ensure that the priority network is not compromised. Probably the two most effective things you can do is show up in the Council chamber Monday night and be visible, and if you’re really keen, register to delegate. If you can’t make it, you can also write to your councillors and remind them that you too are a stakeholder in the form that Union Street will take. 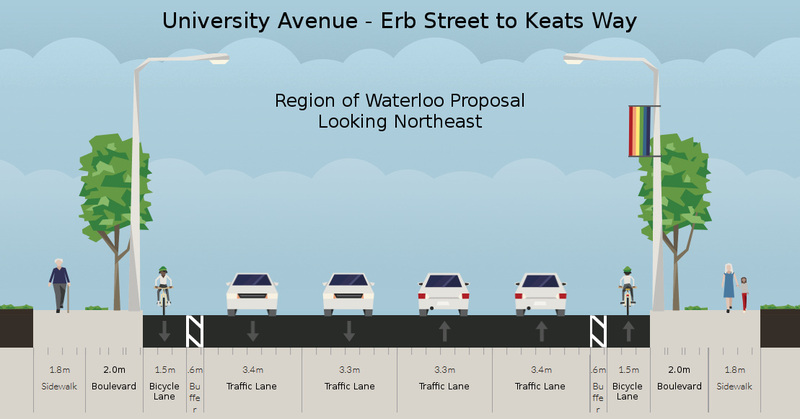 In our last post, we raised some concerns with the Region’s recommended design for the reconstruction of University Avenue between Erb Street and Keats Way. In particular we have issues with the inadequate separation from motor traffic, and the ability to maintain the lanes in winter. Here is a quick overview of a design that we believe better addresses these issues. Illustrated below is the Region’s recommended design. 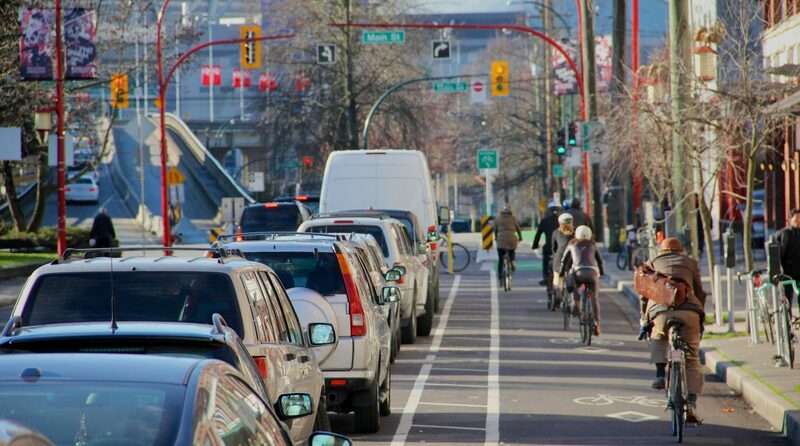 It features 1.5m bicycle lanes separated from motor traffic by 0.6m buffers. It also includes sidewalks on both sides of the street – there is currently only a sidewalk on the east side. To address our concerns regarding bicycle-car separation and winter maintenance, we would prefer that the bicycle lanes be moved off the main roadway. 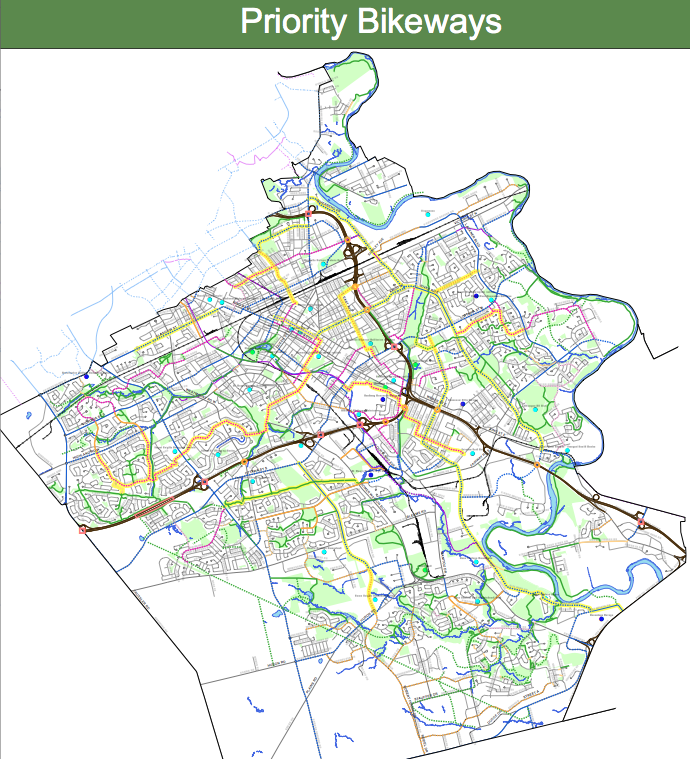 Illustrated below is a road layout that takes up the same space as the region’s proposal but provides bicycle paths separate from the main roadway. This arrangement replaces the two one-way bicycle lanes with two one-way bicycle paths. This type of infrastructure is common in the Netherlands, where it is allows people of all ages and abilities to cycle to their destinations even along fast and busy roads. In this arrangement, the boulevard forms the buffer between bicycles and cars, freeing up the space from the two 0.6m painted buffers to be used for other purposes, such as widening the bicycle path. It is important to note that off-street bicycle paths need to be wider than painted lanes, since cyclists do not have the option to leave the lane to overtake a slower cyclist. Unlike in the region’s plan, we do not propose to add a new sidewalk on the west side of the road. There is no access to the properties on the west side, and there are few origin-destination pairs that would make for a competitive walking trip. As a result, the potential volume of pedestrian traffic would be minimal. With so few pedestrians, it’s hard to justify building and maintaining separate pathways for pedestrians and cyclists. The handful pedestrians that would walk along the west side of the road would not be inconvenienced by walking on the bicycle path, nor would cyclists be inconvenienced by such a small number of pedestrians on the bicycle path as long as it is sufficiently wide. To complement this shared arrangement, there needs to be thoughtful intersection design. The current standard designs for multi-use paths where the path ends at intersections and cyclists are expected to dismount are not acceptable. Fortunately, there are good examples of how to integrate off-road bikeways with intersections. Omitting the west sidewalk saves 1.8 metres in the first improved design alternative, which can be allocated instead to widening the boulevard and the bicycle paths. But this is not a critical component of the design. There could be sidewalks on both sides, or on neither side, and the effect would be generally the same. The end result of this design would be to make cycling along this segment of University Avenue an attractive option for people of all ages and all levels of interest in cycling. While the remainder of University Avenue will remain hostile for now, we urge the Region to use this project as a first instance of a new standard of cycling infrastructure for arterial roads that is safe and comfortable enough for everyone. Could University Ave slip through the cracks? 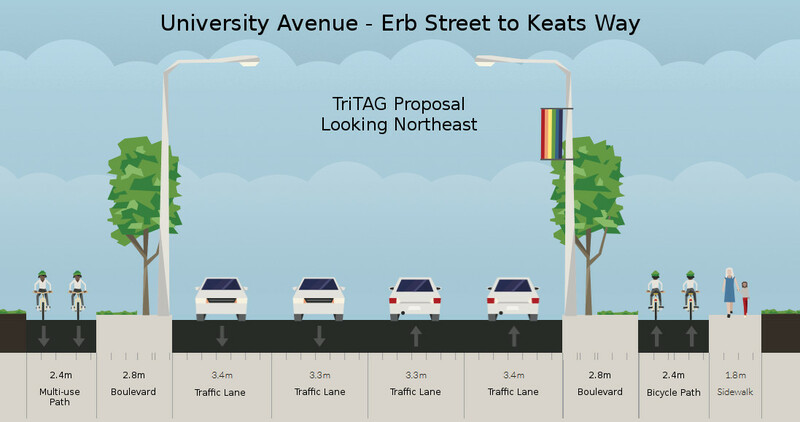 On Tuesday, Regional staff will be presenting a report to the Planning and Works Committee, recommending the widening of University Ave between Erb St and Keats Way from 2 lanes to 4, and the addition of a new sidewalk to the west side where none currently exists. However, while staff had considered some sort of protected bike lanes or cycle tracks, the report rejects them in favour of on-street bike lanes with a narrow buffer. While these on-road buffered bike lanes offer slightly more separation than the existing lanes, and are similar to ones we have supported for Westheights Drive, the context of University Ave makes them less appropriate. University has a speed limit of 60 km/h (which means speeds are typically higher), and sees four times as much traffic during the day. Based on these characteristics, the Ministry of Transportation’s guidelines on bicycle facility design strongly recommends considering segregated bike lanes, cycle tracks, or in-boulevard facilities. The lack of intersections and driveways also makes this block a prime candidate for protected bike lanes or boulevard multi-use pathways (which are less expensive than widened roadways and sidewalks). At WaterlooBikes, Narayan Donaldson calls this justification “the most absurd I have ever seen in a Canadian traffic engineering report.” Basically, we can’t do much to improve the cycling facilities on this section of University Ave, because we have lousy cycling infrastructure at either end – infrastructure where Tiberiu David was struck from behind and killed while riding his bike in 2010. Donaldson goes on to give examples of where fully protected cycling facilities have been successfully transitioned with on-street lanes, demonstrating that integrating on-street lanes with fully protected facilities is in fact possible. Why do recommendations like these happen? Because no one’s paying attention. The report notes that only three people attended the public consultation back in November. As much as we like to think we have a Regional government that somewhat ‘gets’ the need for good active transportation infrastructure, as with any large organization, change really only occurs when people stand up and demand it. It’s plausible that after the poor attendance, the staff responsible may have concluded residents didn’t consider this stretch of road to be all that important, despite whatever latent demand may exist. The Region itself may no longer have the staff resources to keep an “eye on the ball” for active transportation projects like this either. The planner and engineer responsible for developing the Active Transportation Master Plan, along with both Transportation Demand Management planners have either transferred to different departments or to other municipalities, and to our knowledge, none of these roles have been replaced. This void may also be the reason why the Active Transportation Advisory Committee has not been consulted on this project. We hope that as the Region establishes its priorities for this Council term, it will ensure that it has the people it needs to oversee the successful implementation of the ATMP. The good news is that there’s still a short window of opportunity to change the course of the University Ave project, as Regional Council has yet to vote on the recommendation. Why not reach out to your councillors, or speak up at Tuesday’s committee meeting, and let them know you’re paying attention, and hope they will too. Northfield Drive East has a new multi-use path. The stretch between Wissler and Bridge previously was just a two-lane road with unpaved shoulders and no sidewalks or bike lanes. It was supposed to be widened this year to four lanes, with a sidewalk on one side, and a multi-use path on the other, but this work was deferred until work on the Northfield Highway 85 overpass could be completed, to avoid disrupting too much traffic all at once. 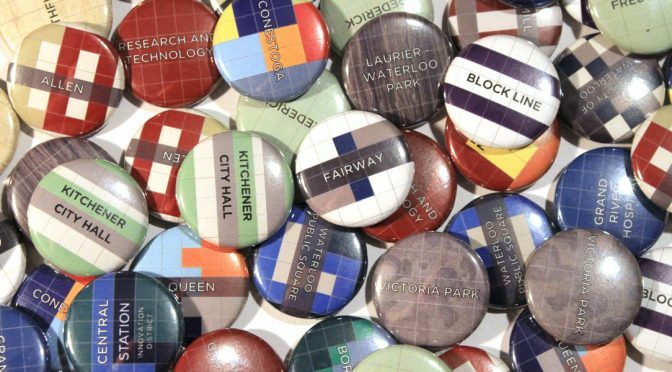 After many years of planning, the City of Waterloo will be making a decision on the future design for Uptown King Street on May 25. The recommended design includes wider sidewalks with more space for seating, trees, and other amenities, improvements to the road design to make driving better, and, for the first time in Waterloo, protected bike lanes separated from traffic by raised curbs and parked cars. To celebrate this milestone for Uptown, and to support the recommended design, the Tri-Cities Transport Action Group and WaterlooBikes.ca are organizing a community bike ride through Uptown Waterloo. 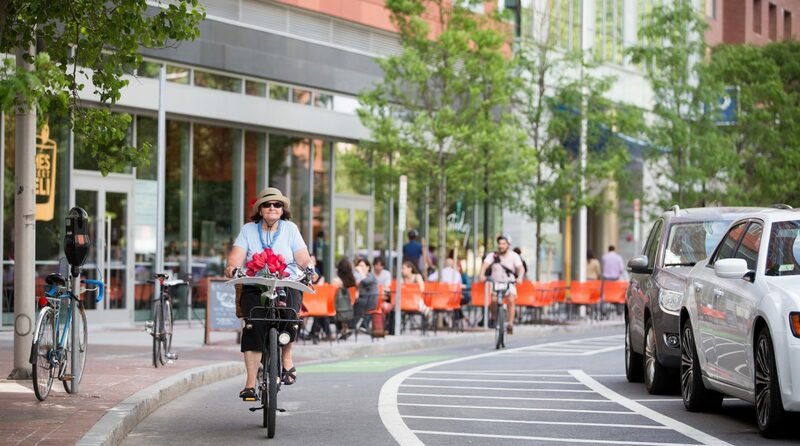 We’ll be gathering in the Public Square around 5:45pm on May 25, and bike up King Street where the protected bike lanes are proposed, circling back to City Hall to join the council meeting beginning at 6:30pm. The proposed design has lots of support – from staff, elected representatives, many of the Uptown businesses, and over 1000 petitioners, and is further encouraged by a study of travel modes and spending habits in Uptown. However, the more encouragement City Council receives for this project from the community, the more likely they will be to continue expanding the active transportation network with infrastructure of this high level of quality. We hope to see you in Uptown next Monday. On Thursday, a neighbourhood meeting was held to present design concepts and solicit feedback on a proposal for bike lanes on Union Street between Margaret and Lancaster. 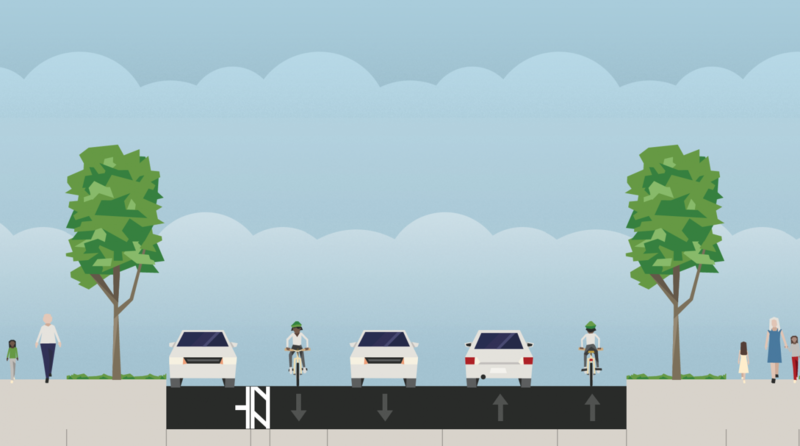 The proposed design would reallocate the existing pavement to designate parking on only the north side of the street, and include bike lanes on both sides. Display boards presented traffic and parking counts, planned and proposed cycling routes, and a diagram of a typical cross-section. 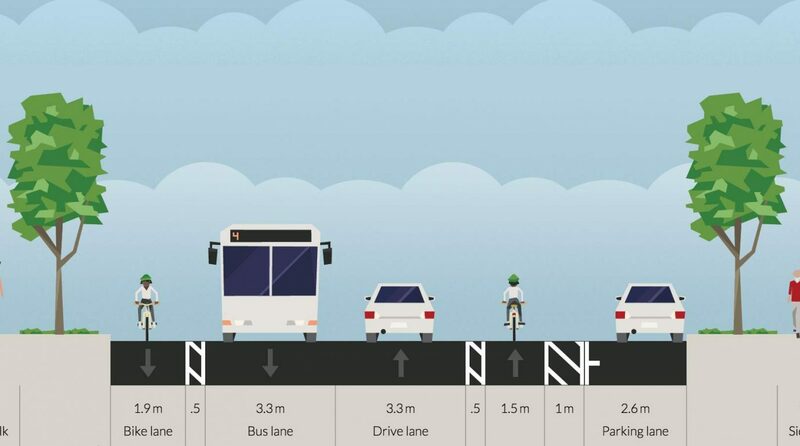 A half-metre buffer would separate bikes lanes from parked cars – a marked improvement from other bike lane projects in the City, such as Margaret or Highland. Green thermoplastic markings, (the same material as the sharrows in Downtown Kitchener), would be used to mark conflict and transition areas. The route would transition to sharrows for the narrow curve through the woods, where speed limits are 30 km/h. Staff estimate that the current on-street parking of about 95 would reduce to 45 cars, but this shouldn’t be a concern, as their counts of parked cars has not exceeded more than about a dozen at any given time. 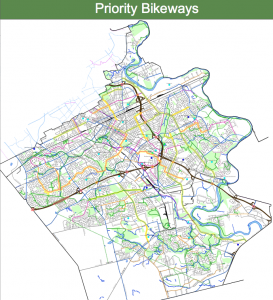 This route is classified as a ‘priority’ cycling route under the City of Kitchener Cycling Master Plan. It’s easy to assume that a project that’s been a ‘priority’ piece of the Cycling Master Plan for the last five years would be automatically approved, but when objections do emerge, it’s important for staff and councillors to know these changes have broad public support. Please consider taking a moment to write them in support of bike lanes on Union Street. Also, be sure to come out to the drop-in consultation for East Ave bike lanes, at the Subscriber’s Lounge in the Auditorium, Tuesday April 21 between 7-8:30pm.